Inside every gilded lily of luxury in Dubai’s 21st-century garden of urban delights, from eye-candy skyscrapers to seven-stars this and that, there are, of course, people who work. Lots of them. They load and unload, carry, build, clean, repair and polish, and, no less than members of more coddled classes, they enjoy a good meal out. In Dubai’s working-class neighborhoods, I discovered refreshingly hype-free eateries as diverse as their patrons, places that simmer with the same passion as the emirate’s flashier haunts. 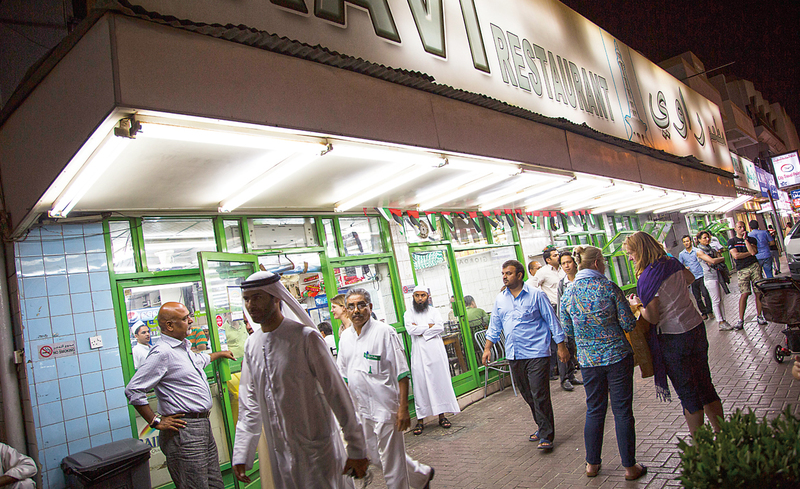 Drawing a steady stream of diners since 1976, Ravi Restaurant is the oldest in Satwa. “Back then it was only a place for working people—Indian and Pakistani construction workers—but now everybody comes,” says one waiter. Conversations might be in any of Arabic, Punjabi, Urdu or other languages. One of the oldest of these neighborhoods lies not far from where the ruling Maktoum family settled in 1833 with some 800 members of the Bani Yas tribe, west of the natural harbor known as “The Creek” and north of the Dubai World Trade Center, along a kilometer and a half of Al Diyafah Street. 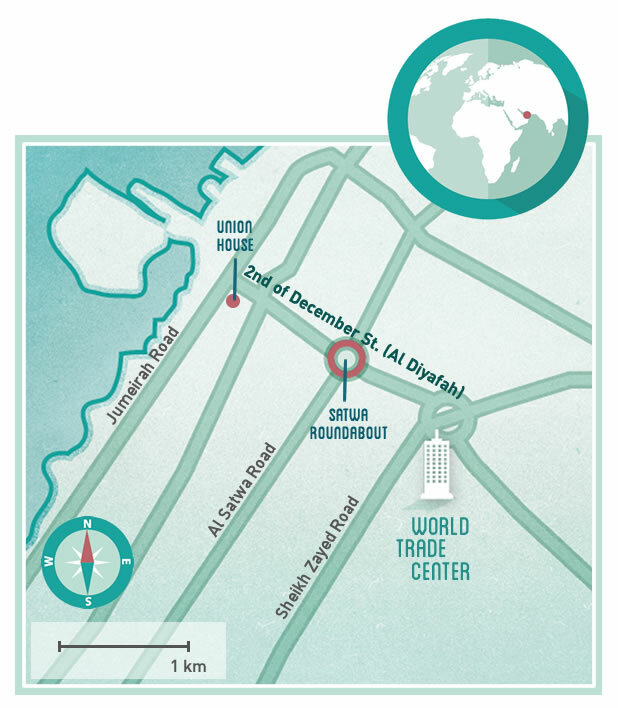 Officially renamed 2nd of December Street in 2011, Al Diyafah drifts along the northern edge of the Satwa neighborhood, where it is home to an unassuming treasure-trove of global cuisine. Quiet by day, the storefronts offer discount electronics and knock-off perfumes; one-man grocery stores advertise in Tagalog, and takeout stands overflow with cheap, fried Indian snack mixes called chivda. Pakistani men in well-worn, tunic-length shirts and baggy trousers called kurta shelwars tarry over Styrofoam cups of Lipton tea sweetened with condensed milk. Down the alleyways between storefronts, laundered kurtas and towels flap from windows and clotheslines, their colors a contrast to the chipped plaster and cracks that run along the concrete walls of row after row of aging, rectangular houses. A generation ago, Satwa was Dubai’s first posh suburb. Beginning in 1966, Shaykh Rashid bin Saeed Al Maktoum, who ruled Dubai from 1958 to 1990, began pouring some of the emirate’s first petroleum income into infrastructure development, which included rows of identical villas in Satwa for E mirati nationals. The original inhabitants have long since moved to finer homes, and now the aging Satwa villas are rented out to foreign laborers. It is at night that Al Diyafah comes alive with expatriates and workers from around the world—but especially from across Asia—who flocked to Dubai over the last four decades, some alone, some with their families. Now a city of more than two million, Dubai claims the fifth-largest non-native population in the world—some 90 percent of its residents. Nowhere is this reflected more clearly than in the restaurants and their patrons along Al Diyafah, where 30- and 40-year-old establishments are among the oldest in town. To explore Al Diyafah, I made a three-evening culinary sojourn, during which I ate my way from South and Southeast Asia to the Near East, all in the few hundred meters between the Satwa roundabout and the Union House at Jumeirah Road (where, incidentally, the formation of the United Arab Emirates was finalized in 1971). Throughout, I was surprised again and again to find that, unlike many of Dubai’s fleetingly transient residents, many employees of these restaurants had chosen to stay for years—some for decades—and often regarded Dubai as home. My first stop, Ravi Restaurant, was tucked back from the main road on the southeast side of the Satwa roundabout. Founded in the mid-’70s, it is the oldest restaurant on the strip. In the barebones dining room, at a long communal table, I savored warm naan (bread), which I used to scoop up tadkha dhal fry, which consisted of creamy yellow lentils refried in ghee (clarified butter) and redolent of cumin and hot chilies. Next up was a plate of chicken karahi bathed in an oily masala (spice blend) that tasted floral—whole cardamom and black peppercorns bursting against the sweet background of meltingly soft onions and tomatoes. Finally, I turned my attention to a platter of fresh-charred kebabs whose caramelized crusts gave way to tender, fatty ground lamb loaded with onions and cilantro. Al Mallah is popular along the 2nd of December Street for shawarma and other Lebanese specialties. Ravi opened its doors amid the first wave of South Asian migration, three years before the completion of the 39-story World Trade Center at the far end of the street, which was the first and tallest skyscraper in the city when it was topped out in 1979. It is quite likely that the men who constructed it came to Ravi for a taste of home between shifts. After my meal, I walked out front where my server, Damodara, leaned against the concrete wall smoking a cigarette and watching the kebab man work ground meat onto flat metal skewers in front of a smoking grill. He offered me a cigarette. I leaned against the wall next to him and asked how long he’d worked at Ravi. “I moved to Dubai from Kerala [in southwest India] in 1984 to come work at Ravi,” he answered. “Back then [Ravi] was only a place for working people—Indian and Pakistani construction workers—but now everybody comes.” After nearly 40 years, Ravi has become an institution, attracting the middle class, tourists and even the wealthy of Dubai while the laboring class moved on to cheaper shops for their daily meals. Hamid Aziz swings a flatbread out of the oven just as he has done for more than 35 years, both at home in Iran and, for the last decade, at Pars Iranian Bakery. I asked Damodara why he had stayed for over three decades. He paused, taking a long drag. Then he shrugged. “Here, I have a life and, after so many years, I find myself comfortable,” he said, flicking his cigarette and hurrying back inside to the tables of men who looked up from their plates to call out in Urdu for more bread. As my eyes followed him into the restaurant, they stopped at the doorway where a young man, no more than 18 or 19 years old, dressed in a blue laborer’s jumpsuit, stood awkwardly just outside. Abdul Hameed looked up and warmly waved him in while calling to the servers in Punjabi. Shortly, Damodara ran over with a takeaway bag as Abdul Hameed ignored the boy’s attempt to pay. The laborer put his hand to his chest and nodded gratefully before disappearing into the Satwa night. I departed Ravi, making my way across 2nd of December Street’s grassy, manicured median to find Pars Iranian Bakery and Kitchen behind a fenced-in basketball court where groups of Filipino teenagers played. Outside, under the restaurant’s bright sign, I watched a slight man with a shock of white hair and a soft, grandfatherly face deftly rub a wooden paddle with water, sprinkle it with sesame seeds and slap on wet dough that he jabbed repeatedly with his fingers until the long board was covered and the dough was dimpled enough to prevent it from puffing. He stuck the paddle into the oven, flipped it and spread the dough over the hot rocks. 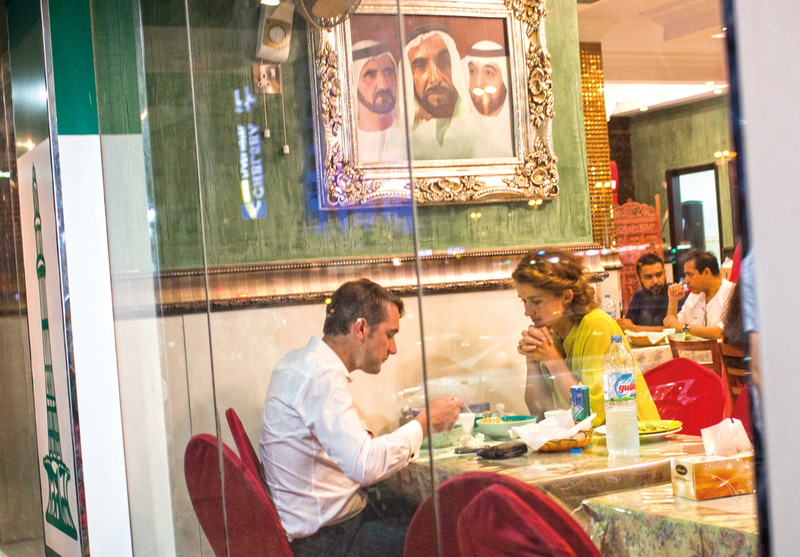 At Pars Iranian Bakery and Kitchen a pair of diners enjoy dinner under an Emirati official portrait. From him I learned how four Persian business partners opened the restaurant in 1989. Since then, the place has garnered a citywide reputation for exquisite rosewater profiteroles, generous Iranian mixed grill and the authentic Iranian bread Aziz spent his evenings baking. “One of the owners knew Hamid back in Shiraz, where he baked bread for over 35 years, and 10 years ago, they convinced him to come bake here,” Abdul Ali explained. The quiet, almost somber air about the grand Persian eatery was reflected in Aziz’s dignified, singular focus. Aziz grabbed a metal hook and flipped the thin bread with a swift yank, tossing the long, flat loaf onto the stainless steel table in front of us to cool. Abdul Ali disappeared into the main building. He returned with a plate of herbs and cheese, and Aziz motioned for me to eat. I tore off a piece of the chewy bread, smeared it with cheese, folded it over a handful of purslane and mint, and took a bite. The combination of toasty sesame seeds, bitter herbs, salty cheese and warm bread could be, I worried, downright addictive. The next evening, I walked from Union House toward the Satwa roundabout, stopping at the intersection of Al Diyafah and 6b Street under the manic green-and-white lightshow of Al Mallah restaurant. Nearly every sidewalk table was full. Young Lebanese men heckled each other cheerfully in the open kitchen overlooking the dining area as they cooked round after round of crisp manoushe, circular Lebanese flatbreads garnished with any number of toppings from simple olive oil to spiced mincemeat. The employees’ green shirts were embroidered with Phoenician boats and the Arabic letters for Al-Mallah—seafarer or navigator in Arabic. 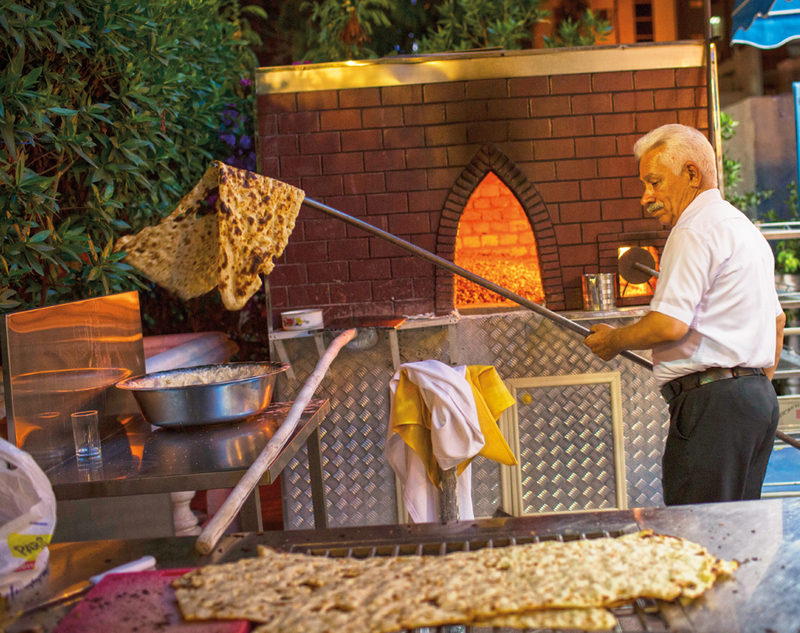 Opened 28 years ago, Al Mallah has been managed by 78-year-old Abu Faisal for the last 22. “Sit, sit, please,” Abu Faisal said to me as his smile sent an explosion of creases from the sides of his eyes. “What do you like? Some hummus? Babaghanoush? Tabouleh? Manoushe? Shawarma?” Without waiting for my answer, he leaned and grabbed a passing server, murmured into his ear and sent him off with a firm slap on the back. Moments later, a platter of fresh vegetables was almost as firmly slapped down on our table, along with bowls of fatoush salad, hummus, babaghanoush, falafel and a tray piled high with manoushe topped with olive oil and za’atar, a Levantine blend of thyme, sumac, sesame seeds and salt. “I love to eat good things, and I love to feed people good things. That’s why I became a chef at the age of 12,” Abu Faisal confessed, winking as he sat down to join me. We began to eat, passing the salads, dragging vegetables through the tahini-rich hummus and smoky babaghanoush, and cutting wedges of the oily flatbread. I licked some za’atar from my fingers and asked Abu Faisal if he missed his homeland. 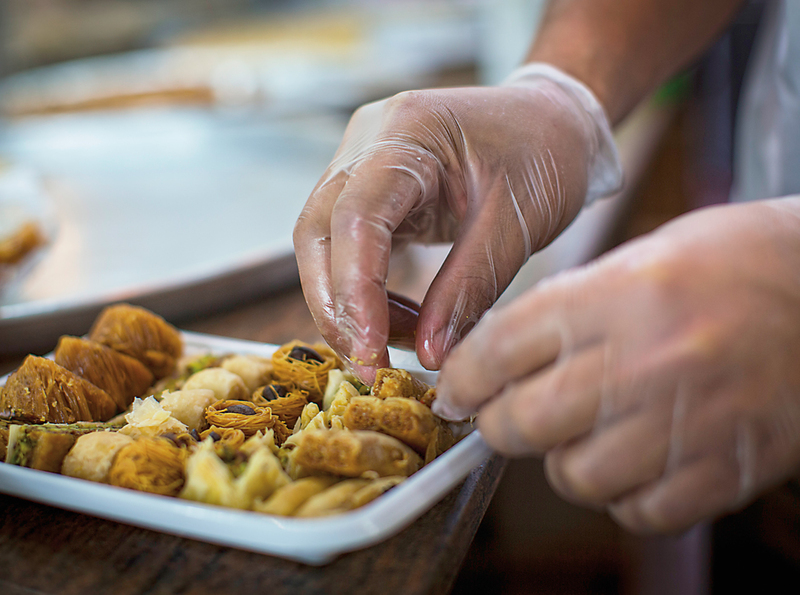 An attendant arranges a Palestinian-Jordanian dessert sampler at 23-year-old Firas Sweets. He took a sip of his tea and got up, sauntering into the kitchen to check on the grill chefs before walking back outside to join the bread bakers’ banter, wagging his finger at them and grinning. Of his staff of 40, he said, 15 are Lebanese, and the rest hail from others parts of the Middle East and South Asia. As the lights of the Al Mallah sign flashed and danced, a joyful roar emanated from the tables. A smiling Pakistani family passed plates of kebabs, a group of Emirati men picked at their platter of roast chicken, and a Filipino couple sat whispering to each other over a heaping plate of shawarma and hummus. All the while, men in Al Mallah polo shirts rushed among the tables and couriered takeaway orders to idling cars along 2nd of December Street. I said goodnight to Abu Faisal and set off to find some dessert. Ambling northwest to the next block, I stopped in front of the plate glass window of Firas Sweets, a 23-year-old Palestinian-Jordanian dessert shop. From there, I watched a young Egyptian man cut thick squares of na’awa, cheese topped with syrup-soaked semolina cake, for an elderly Arab woman. As an Indian couple and a glamorous, abaya-clad woman entered the shop, I inhaled the aromas of sugar and rosewater that drifted out. I followed behind them and ordered a slice of knafe, a specialty of the Palestinian city of Nablus. I found a table facing the large window and enjoyed not only the savory-sweet dessert of soft white cheese topped with sugary, crisp-fried vermicelli, but also the parade of Satwa residents and visitors passing by. On my last night, I ended up just west of the roundabout amid a cheerful hum in a Filipino franchise diner called Tipanan, one of the newest restaurants on the strip. It opened in 2012, supported since by the growing Filipino community in the area. I nibbled on the so-called khaep mu, traditional Filipino pork cracklings adapted here for the Muslim host country by swapping crisp-fried chicken skin for the pork rind. I dipped the crunchy bits in tart, rose-colored vinegar—a perfect foil for the greasy, salty snack. Above me, a Tagalog singing competition flashed on the two flat-screen tvs. Some of the customers watched intently while others murmured over plates of fried rice and deep bowls of steaming soup. The buzz was punctuated by eruptions of laughter from a table of Filipino boys in baseball hats sporting tattoos on their biceps. At Filipino franchise Tipanan, customers savor cuisine that combines influences from South Asia, China and colonial Spain. Michael Pangilinan, the young manager in his mid-20s, walked over with a sizzling platter of stuffed squid and a steaming bowl of his most popular dish, bulalo, a simple beef broth soup. Two women joined us, bringing platters of chicken adobo and fried rice. I took a sip of the bulalo. It was like a gentle hug in a bowl: The brightness of cilantro balanced the richness of the marrow-infused broth. I could see why it was the most popular item on offer. I asked Pangilinan if he had plans to move back home. Felicia Campbell holds a master’s degree in Middle Eastern food culture from New York University, and she is the author of The Food of Oman: Recipes and Stories from the Gateway to Arabia (Andrews McMeel, forthcoming October 2015). She splits her time between the Arabian Peninsula and New York City writing about food, travel and culture.